A new townhome development by McQueen Construction is is nearing completion near downtown Courtenay. The 10 new home development offers two and three bedroom homes in two buildings, each with four linked townhouses; and two additional townhouses. 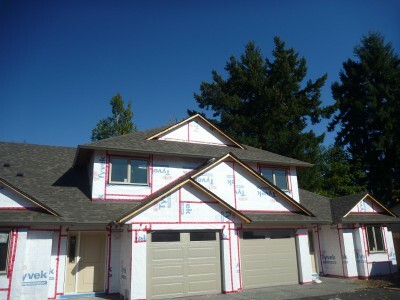 These Courtenay townhomes will be ready for viewing at open houses soon. Floor plans for the Piercy Avenue Townhomes range in size from 1,300 to 1,600 square feet. Piercy Avenue townhomes will feature hardwood flooring, solid wood cabinets, and come complete with appliance packages. Many of these new homes also offer the option of having the master bedroom on the main floor. The homes have attached garages and additional driveway parking, and the development will also have guest parking spots. Located only a few blocks from downtown Courtenay, Piercy Avenue Townhomes are set in a sunny, central location in this growing Vancouver Island city. A new home development in Courtenay is now selling its final units. With only five of the 20 duplex homes left at Woodcote Mews, homeowners still have the option to choose their own colour schemes, before moving in. All of the remaining homes have been completed to lock-up, and can be finished and ready for you to move in within a month. The developer will complete the interiors of the units once the new owners have selected their colour schemes. The new real estate development has been popular with young families, empty nesters, and those looking for a Vancouver Island vacation home. And now these 1,320 sq ft duplexes are priced at $199,900. These new Vancouver Island duplex homes feature a spacious layout, with three bedrooms and two bathrooms. Each unit includes a quality appliance package with refrigerator, stove, dishwasher, washer and dryer. An open house is held every Saturday from 11-12:30. Only three lots lots are still available in the Bonnington Ridge neighbourhood in the Fairwinds Golf Community, located along the waters of Nanoose Bay. The real estate development offers ocean view and fairway lots for sale, situated on a quiet cul-de-sac, with prices starting at $240,000. The residential lots on Bonnington Ridge offer panoramic views, and the new executive west coast homes in the area integrate luxury living with the natural beauty and tranquility of the area. A cul-de-sac setting ensures a peaceful street. Covering approximately 1,350 acres of lush countryside, Fairwinds has an abundance of wildlife surrounding the natural landscapes. Located only 15 minutes north of Nanaimo, on the east side of Vancouver Island, Fairwinds is the destination of choice for those seeking a luxurious West Coast lifestyle. This community features a spectacular golf club, Schooner Cove Marina and a recreational fitness facility. 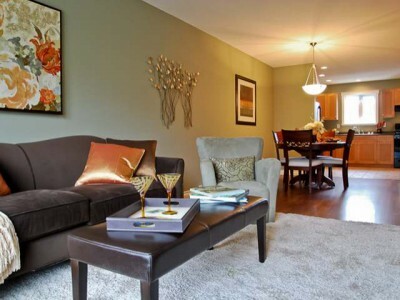 The Bonnington Ridge neighbourhood is only a few minutes walking distance to Fairwinds Centre. Stop by their sales centre or send them a message to learn more. 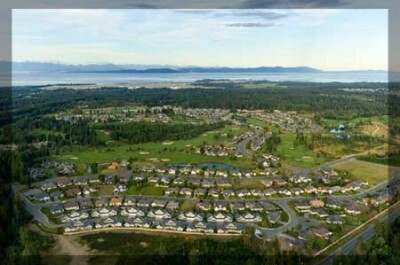 The Ridge is a new master-planned residential community now under construction in South Courtenay on Vancouver Island. This new residential real estate project is a modern development, designed around the principals of sustainability, offering panoramic ocean and mountain views. The Ridge will feature 230 single family residential building lots, with some of the lots featuring zoning to permit duplexes and carriage homes. There will also be two multi-family building sites, with opportunities for patio homes or multi-level strata condominiums. The Ridge will be developed in several phases, with the first phase containing 69 lots. The Ridge embraces the principals of sustainability, and will have strong architectural guidelines and building schemes to protect property values. This 77-acre community will include an extensive network of walking trails, parklands and open spaces featuring open waterways. It is directly connected to the Millard Creek Nature Park. While the community has a peaceful rural feeling, it is a fully modern urban development adjacent to the shopping, restaurants and other amenities Courtenay's urban centre. The lots at The Ridge will range in size from 7,000 to 12,000 square feet. For more information, contact the developers or visit their website. Dale’s Plumbing and Mechnical specializes in residential and commercial plumbing in Campbell River and in the Comox Valley. Emergency plumbing services in Campbell River and the Comox Valley are now just a quick call away, and Dale's expert team of plumbers works hard to establish a quick response time for service calls throughout the North-Central Vancouver Island region. Dale’s Plumbing and Mechanical has been operating on North Vancouver Island for more than 30 years and their quality workmanship has earned Dale’s a reputation as a premiere Vancouver Island plumbing contractor. 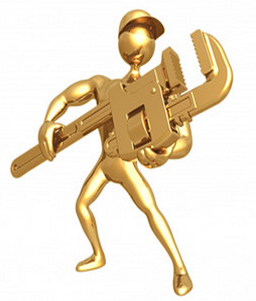 Dale’s Plumbing specializes in new construction plumbing and plumbing renovations. They are also the one's to call for all your plumbing service needs. Experts in their field, they boast a 96% on-time completion record. Dale’s Plumbing will manage all stages of a plumbing project with honesty and integrity while offering great value. New building lots are now available at the Crown Isle Resort and Golf Community in Courtenay. Crown Isle is offering new residential lots in Hampton Gate – an exclusive gated community with only 45 new home sites. Reserve your future home site today, and enjoy the peace and tranquility of Crown Isle's latest single family home development with the added security of a gated entrance. Local custom builders, including Crown Isle's own in-house team at Homes by Crown Isle, are waiting to design and construct your next dream home. Phase One of this project has been cleared and servicing will begin later this fall. Available lots range from $185,000 - $295,000. Additional Crown Isle lots are also available in the Idiens Way and Cambridge Park Estates subdivisions. Custom homes at Crown Isle are built in West Coast Contemporary style, and designed to highlight the area's golf course and mountain views. Courtenay's Home Hardware Building Centre's Central Rentals welcomes John Leckie as the new rentals manager. John and the team at Central Rentals offer equipment rentals in the Comox Valley. Offering unmatched service and selection, the experienced staff at Central Rentals is ready to help homeowners and contractors find the equipment they need. Central Rentals has all the tools and equipment to get any Comox Valley project done right, and renting means you'll always the right tool for the job. Central Rentals' Comox Valley equipment rentals division can supply: mini excavators; bobcats; scaffolding, construction security fencing; jack hammers; compactors; floor sanders; laser levels, and more. Central Rentals in the Comox Valley offers rates from half-day up to long term on equipment rentals. 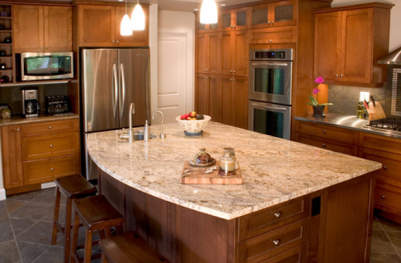 Inspired Spaces By Harbour Kitchens & More Inc. specializes in kitchens, millwork and Murphy (wall) beds on Vancouver Island. Based in Courtenay, Inspire Spaces by Harbour Kitchens & More takes your construction process seriously, whether you are building a quality home or remodeling your current one, needing better storage space or to beef-up a bedroom. "We inspire to create products for those who appreciate quality made by skilled craftsmen and experienced design staff" is the company's motto. Imagine entering into your new kitchen with a feeling of pride and excitement; whether for entertaining company or comfortable living with your family. Your kitchen by Inspired Spaces & More will be a center-piece in your home. Inspired Spaces & More is an established Comox Valley millwright company with many years of experience in manufacturing of entertainment units, fireplace mantels, commercial offices and customized furniture pieces. Inspired Spaces is the only authorized Murphy Bed dealer for Mid and North Vancouver Island. Murphy Beds, also known as wall beds, are an economical way to instantly transform a second room into a chic office or an elegant guest bedroom. Choose from a standard model or work with an Inspired Spaces designer to customize your dream wall bed with cabinets, molding and finishes. 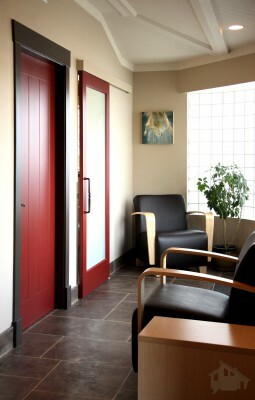 Contact Inspired Spaces today at 250.898.9670 and start creating your own inspiring space. Tamarack Construction, a custom home builder in Campbell River, will soon be starting a new custom home project – a multi-level, 3,000 sq ft home on a view lot. Final designs for this new home are now being completed. The company recently sold their Maryland Estates showhome, and also completed a new custom home on Pacific Heights Lane. The happy homeowners have recently moved into their Campbell River custom home. 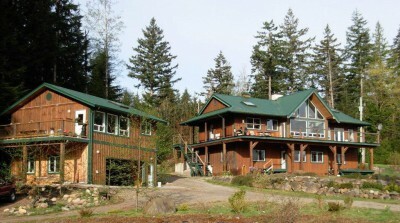 Tamarack Construction is also currently selling a custom ocean view home on Quadra Island. Tucked away at the end of a quiet road and bordering forest on two sides, this beautiful 1.37 acre ocean view property on Quadra Island features a main home, carriage house and shop. Built by Campbell River custom builder Tamarack Construction, this dream home offers 3,280 sq ft of well-designed living space. The main floor features a beautiful open layout with a chef's dream kitchen and spacious dining room. The living room features exposed beams and impressive rock fireplace. A master bedroom fit for a king, with a gorgeous ensuite and French doors leading to the balcony. The lower floor features spacious bedrooms, over height ceilings, a massive bathroom, and huge open family room, and more. This property is perfect for a big family, a couple who enjoys house guests, or a B&B. This property also features a 2-bedroom carriage house, located above the 780 sq ft shop. Comox Valley realtor Tina Vincent's featured listing is a great new 3 bedroom family home in Comox, priced at only $389,900. Located at 350 Forester Avenue, this main level entry home has been tastefully finished, boasting exceptional quality and workmanship throughout and having something for everyone. An open concept main floor offers a good-sized kitchen with maple shaker cabinets, an island and eating bar. The kitchen opens to a generous great room, and a dining room. Upstairs features three generous bedrooms, with a 4-piece ensuite and walk -in closet off the master, plus an additional family area for the kids to hang out. Set in a fantastic Comox neighborhood and close to CFB Comox and schools, immediate possession of this new home is available. Contact Comox Valley Realtor Tina Vincent, PREC, with Royal LePage in the Comox Valley to request a viewing of this new home. AA Mini Storage offers multiple levels of security for its self storage units for rent, including video surveillance, gated access, and resident managers on site. AA Mini Storage Nanaimo offers one month free for any paid-in-advance self storage unit rentals of two or more months. These Nanaimo self storage rental units range from 5x5x5 to 20x30. AA Mini Storage has a variety of self storage units, suitable for storing anything from business equipment to the contents of a house. AA Mini Storage offers convenience as well. The units are available 7 days a week and with drive-up doors available on 10x10x10 units and larger, your locker is always easily accessible. Comox Valley realtor Scott Fraser, PREC, is now selling lots in Cumberland's Coal Valley Estates. Phase 4 of this project features 34 lots, priced from $137,500. The development is also offering building terms with $20,000 down. With the number of lots for sale in the Comox Valley currently being very limited, these Cumberland lots are expected to be popular. Zoning in the development allows for homes with secondary suites. The area offers mountain views and is known for biking and hiking trails. These new homes sites are located within walking distance of the Cumberland elementary school and are only minutes from the recreational area of Comox Lake and the amenities of Courtenay. New single family homes are being offered in the WestRidge Homes development in Nanaimo by the real estate experts at McCullough Marketing Services. Professionally appointed, these new Nanaimo homes feature beautiful high-quality interiors and most include full 9-foot basements and a self-contained legal suite option. Each home includes generous gathering spaces for family living including a gourmet kitchen and luxurious great room. These new homes in Nanaimo also include a two car garage and are within walking distance to community recreation, walking trails, and schools including Vancouver Island University. Easily accessible from downtown Nanaimo, WestRidge living is inspired by relaxed living, convenience and affordability within a master-planned neighbourhood. The project is in its second phase with six homes still available for sale between $329,000 and $369,000. 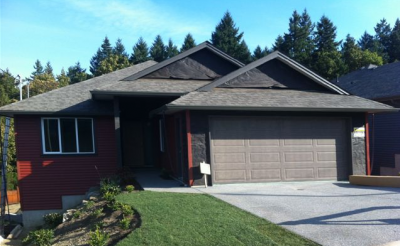 The WestRidge open house is weekly on Sundays and Saturdays from 2-4 pm and is located at 216 Westwood Road in Nanaimo. For more information regarding this new home development offered by the McCullough Marketing Team in Nanaimo, please contact Brian McCullough at Coast Realty Group in Nanaimo at 250.758.7653 or toll free 1-800-779-4966. Double A Safety Services on Vancouver Island offers up tips and reminders to keep workers safe this winter. Rain Gear. Good quality rain gear and boots. There are many good quality, CSA approved work rain boots, keeping your feet dry and warm, is just as important as the rest of your body. Dress in layers. Use many thin, warm layers rather than a few thick layers. It will insulate better and allow you to strip off layers if the temperature climbs. Have somewhere to store the layers to keep them dry. Dress for the appropriate activity level. Dressing for an active day of logging will be different than dressing for a day of fishing or construction. - Buy or find a pair of insulated boots. Ideally, the lining should be wool or synthetic--not cotton. Linings can be purchased separately. Mark’s, Ono’s and other work supply stores carrying a variety of CSA Approved insulated work boots and linings. - Wear winter socks. Warm winter socks are important in keeping warm dry feet. Wool is best, although good synthetic "fleece" socks are often quite good. You can layer socks, but be careful that your feet are comfortable and the circulation isn't shut down. Carrying extra pairs is a good idea as well, to change into a fresh, dry pair if required. - Use a good quality coat, parka, or jacket. Generally speaking, the thicker the better, whether it is a synthetic ski jacket, a wool pea coat, or a down jacket. - Wear a base layer. A "base layer" is long johns, union suit, long underwear, or whatever can provide a warm, light base to your winter gear. Merino wool products are recognized as one of the best base layers available. - Wear a hat. Remember - heat rises, and you don't want to lose it. - Wear gloves or mittens. Fingers and hands are very vulnerable to the cold, so keep them covered. Very thin gloves (like "magic gloves") are better than nothing, but comfortable, warm gloves are important. - Hand warmers can be useful, especially if you don't have shelter handy. They can be purchased at any outdoor or hunting store. Never use these as a substitute for dressing warmly, however. - Wear more than one layer on your legs. Oddly, some people will wear five layers on their torso, and only one layer on the legs. At minimum, have a base layer like long underwear and an outer layer, like snowboarding pants. - Keep dry. Being wet will cause chill to set in more quickly than if you're dry. Have waterproof or at least water resistant outer layers. - Carry a whistle. Attach a whistle to your jacket or work vest with easy access, in the event of slipping and falling in dense foliage, or if trapped on the other side of an avalanche or landslide. Blowing a whistle will use less energy than yelling or screaming, and can assist rescuers in finding you. For more information about job site safety, contact Alana Gow of Double A Safety Services. 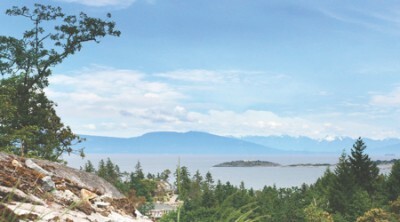 The Gales is a real estate development in Ladysmith offering oceanview patio homes and condos. These new homes offer an amazing location, surrounded by nature and featuring ocean views. Inside, these new bungalow-style town homes and condos offers top quality finishing, with remarkable attention to detail. Homes at The Gales are designed and built in West Coast contemporary architectural style and floor plans are open, ideal for entertaining. Warm earth tones through out the homes complement the coastal landscape. Wide sunny decks give you plenty of room to take in the views outdoors. Ownership at The Gales offers residents the opportunity to enjoy an idyllic Island lifestyle. Living at The Gales means enjoying year-round walks on the many local beaches and leisurely strolls through the pristine forest right at your back door. And owners at The Gales can relax, knowing the that their landscaping and yard maintenance are taken care of. This development is located in Ladysmith, a community with year-round outdoor activities and adventures, along with one of Canada's most temperate climates. Bethany Pearce of Capstone Dwellings Design-Build is building a portfolio of satisfied commercial clients for building design, interior design, feasibility studies, construction procurement consulting and project management in the Comox Valley. Having committed early in her career to a specialized model of Design-Build, Bethany has brought the unique process to the table for commercial construction projects. 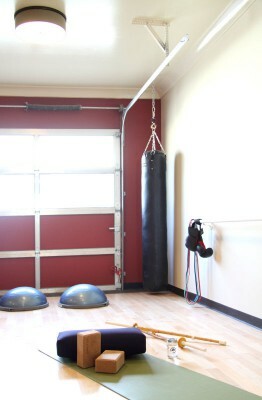 In the past, Bethany has lead her team in completing design and renovations to Sunrise Veterinary Clinic in Comox and recently took full responsibility for the design and construction of Ki Fitness and Health in Courtenay’s Tin Town. Her most recent project includes offering professional design and consulting services to a private commercial client in the Comox Valley. In this project, Bethany is working directly with the property owner to develop a design concept, co-ordinate with architects, consult on feasibility, and lead in construction procurement for design-build delivery. Bethany encourages any commercial property owners or those needing lease- hold improvements to call her office and discuss their needs. Bethany’s consulting practice can assist with anything from construction planning and permitting, to assistance navigating zoning and bylaws. 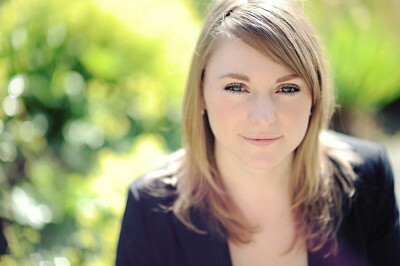 Bethany Pearce of Capstone Dwellings Design-Build is available to discuss projects across Vancouver Island. Only six new town homes are still available at Courtenay's Diamond Park Townhomes on Centennial Drive. Construction and landscaping in the new townhome development is complete, and many of the new homes are now occupied. 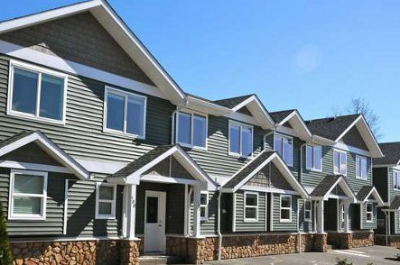 These new Comox Valley townhomes are 1,094 square feet in size, with three bedrooms and two bathrooms. Each unit comes equipped with stainless steel kitchen appliances and a washer and dryer. 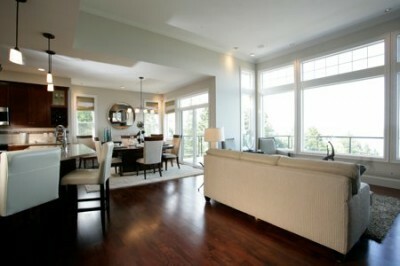 These Comox Valley townhouses feature upgraded lighting, hardwood floors and contemporary interior finishing. The project also includes sprinkler systems, backyard patios and fenced yards for each unit. These homes are centrally located only minutes away from North Island College, CFB Comox, community services and shopping. A children's playground is also on the property, creating a family-friendly real estate development. This new real estate development offer excellent value, with new homes from $175,900-$181,900. One show suite remains at $186,900. Tour the Homes during Open Houses held Thursdays and Fridays from 2-5 p.m., and Saturdays and Sundays from 12-3 p.m. For more information contact Realtor Tracy Fogtmann with Re/Max Ocean Pacific Realty in Comox. Outlook Land Design Inc. is currently working on a number of significant Comox Valley and Vancouver Island projects, including taking on the role of Landscape Architect for the proposed new construction project at 2525 Mission Road in Courtenay. Outlook Land Design is also working as the Landscape Architect for North Island College, as part of the North Island Hospitals project, as well being the civil engineer and landscape architect at Smelt Bay on Cortes Island. Outlook Land Design Inc. provides civil engineering (municipal engineering) services including: specifying, designing and constructing streets, parking lots, sidewalks, water supply networks, sewers, street lighting, public parks and bicycle paths. Outlook Land Design Inc.'s landscape architecture solutions include the design of outdoor and public spaces. Past clients include provincial and municipal parks, schools and college campuses, resorts, multi-family housing projects, and institutions. The scope of their work includes: urban design; site planning; town or urban planning; environmental restoration; parks and recreation planning; visual resource management; and green infrastructure planning. In addition to their Civil Engineering Services, Outlook Land Design Inc. works for private sector developers, Open space projects, LEED projects and local government services. For a full description of Outlook Land Design Inc.'s services, visit their website or contact Tim O'Brien via phone (250) 339- 5222, or email outlookland @shaw.ca. Springwood Park is a new Campbell River patio home development located on McPhedron Road. Phase I of this bare land strata real estate project includes 26 homes and 17 of these homes have already been sold. These new patio homes range in size from 1,300 to 1,400 square feet and have three bedrooms or two bedrooms and den. 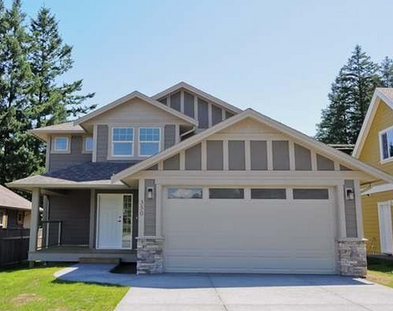 All of these Campbell River homes offers two bathrooms, including a spa ensuite. They also include hardwood floors, granite countertops, blinds and landscaping. Cozy covered patios offer private outdoor space. Four additional units are now under construction and two more units will be started next month. Prices range from $249,000 to $289,000. Open houses are held from 12-3 pm Tuesday-Thursday & Saturday-Sunday. Visit the sales office at 48 South McPhedron Road. Boardwalk Place ocean view condos and townhomes in Nanaimo are offering a fall special of an upgrade package, worth up to $5,000, paid for by the developer. These new Nanaimo ocean view homes have been created to offer all of the luxury, style and conveniences of a luxury home. Along with spacious floorplans that feature gourmet kitchens, over-height ceilings, luxurious appliances, designer cabinetry and spa-like en suites, there are also more than a dozen floorplans to choose from. By combining style, comfort and convenience with traditional craftsmanship and today’s most advanced and durable construction technology, Boardwalk Place offers the long-term value, quality, style and refined luxury you’re looking for in a new Vancouver Island home. 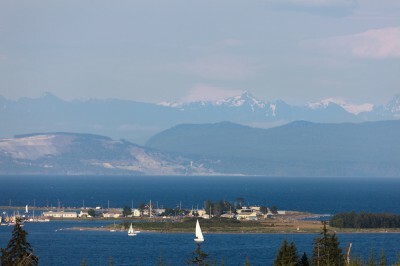 Set in the historical Newcastle neighborhood of Brechin Hill, steps from the Nanaimo Yacht Club, Boardwalk Place offers great Vancouver Island lifestyle options in a spectacular ocean front community. 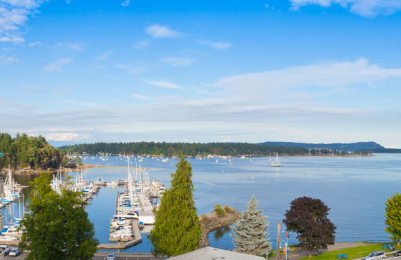 From the luxury of your own private courtyard and the natural beauty of living close to the water, to the abundance of recreation, shopping and dining of downtown, Boardwalk Place Nanaimo condos offer so much to explore just outside their doors. Boardwalk Place is now 30% sold. These ocean view condos and townhomes start at only $238,888, offering excellent value in new Vancouver Island real estate. The Boardwalk Place presentation centre at 370 Stewart Avenue, Nanaimo, is now open by appointment only. Hopwood Drywall Systems brings a dynamic crew of experienced drywallers to the Comox Valley. Quality work, clean job sites and work done on or ahead of schedule distinguishes Hopwood Drywall Systems from the competition. Available for commercial and residential drywall projects from boarding to finishing, Hopwood Drywall Systems offers professional and enthusiastic service. With more than 10 years of experience serving Vancouver Island customers, Hopwood Drywall Systems is now serving the Comox Valley including Courtenay, Cumberland, Comox and outlying areas. J.R Edgett Excavating Ltd. is the only company offering full Vactor Truck services on North Vancouver Island. Hydrovacting is a safe, productive and non-destructive method of excavating. It uses pressurized water and a vacuum system to safely excavate around utilities and pipelines. Water is pressurized and injected into the ground to safely wash the soil from underground infrastructure. The resulting slurry is simultaneously vacuumed from the excavation through a large debris hose and temporarily stored in a debris tank. 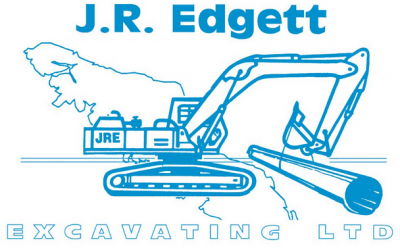 J.R. Edgett Excavating Ltd. has been operating in the Comox Valley for more than 45 years. Specializing in all phases of municipal and civil services, commercial site servicing, and new residential subdivisions, J.R. Edgett Excavating Ltd. also offers site clearing and burning, riverbank construction and armouring. With a crew of 30 employees working in and around the Comox Valley on Vancouver Island, J.R. Edgett Excavating has the equipment and ability to plan and complete projects to their client’s utmost satisfaction. The Canadian Home Builders Association on Vancouver Island recently presented its Lifetime Achievement Award went to Ron Egli, of Ron Egli Construction and Design Ltd. for his many contributions to the industry ranging from housing affordability to building code solutions. The prestigious Lifetime Achievement Award is presented to an outstanding member of the CHBA on Vancouver Island in recognition of their professionalism, dedication and service to the Association and the residential construction industry. This award is presented to the member who has demonstrated an outstanding level of commitment to the goals and principles of the Canadian Home Builders' Association. The winner will receive a "CARE Awards Lifetime Achievement" trophy and certificate. 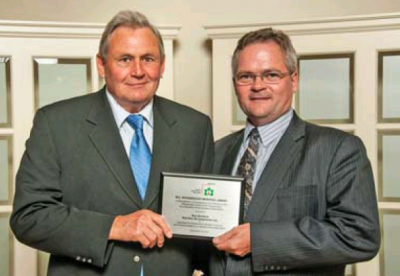 Ron Bickford of Rob-Ron Developments won the 2012 Bill Wansbrough Memorial Award, which honours the contribution made by Bill Wansbrough to the residential construction industry. It is donated in his memory to recognize significant individual achievements that do not necessarily fit into any of the categories of the CARE Awards. Bickford was honoured for important contributions to Builders’ Council and communications work on behalf of the association and industry. Campbell River Realtor Jenna Nichol of Coast Realty Group has a listing for a .57 acre treed and level building lot in the Robinson Lake community, halfway between Courtenay and Campbell River. This lot is located in a quiet, rural setting across from the private lake Robinson Lake. This large building lot for sale covers 0.57 an acre in a treed, private setting. Join the Robinson Lake Property Owners Association for $100/year to enjoy usage of the lake, which is stocked with trout, and join in on their many social events. Robinson Lake is perfectly situated for enjoying all of the amenities of Campbell River, the Comox Valley, Mount Washington, Strathcona Park, and the nearby ocean beaches. The lake is perfect for swimming, canoeing, and sailing. No motorboats are permitted to keep the water clean and the area peaceful. This rural building lot is priced at $84,900. For more information contact Campbell River Realtor Jenna Nichol.